When I was in 7th grade, I had this fabulous red pop-up brush compact that I stashed in my locker. It had a special place right next to my mirror. Every day at lunch, I ran to my locker and pulled out the compact, popping out the brush and running it furiously through my hair to make it as shiny as possible before heading into the cafeteria. One of the saddest days of my life was the day that brush broke in half and I had to throw it away. 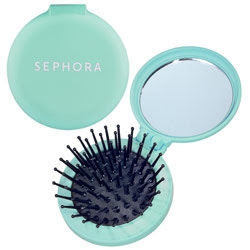 Luckily, now I can stock up on new ones -- and relive the days of my youth -- with the Sephora Brand Pop-Up Travel Brush. This one is exactly like my fave version from junior high. The bristles don't tug or pull at your tresses, and the mirror is the perfect size for glancing in and performing quick lipgloss or eyeshadow touchups. I'm totally in love with the color, too -- the aqua shade really pops against the dark interior of my bag and just makes it so easy to find at a moment's notice. But what I really love? The price. This baby is only eight dollars on Sephora's website! Plus, if you're not crazy about the aqua, you can get it in orange -- which transitions ever so nicely from summer to fall. All in all? My junior high days are coming back big time. Ooo this is to cute!